Once upon a time, men were told not to wear black and brown together; similar to avoid combining black with navy. Realistically, black has a really hard time pairing with anything other than grey and white. I think it’s because as soon as it sits next to another color, the black starts to look less rich and deep. 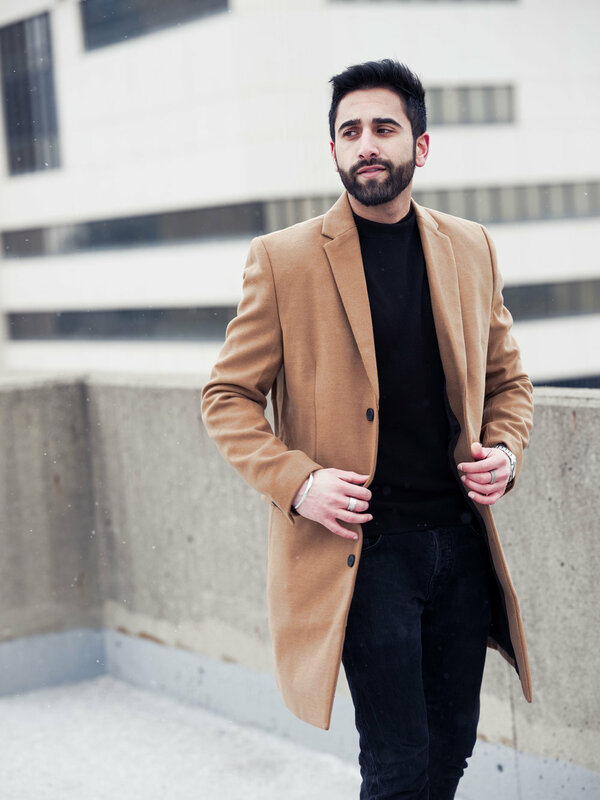 However, when it comes to wearing brown with black, for example brown boots with black jeans, this is something you can easily incorporate into your own looks. You want to choose a brown in contrasting tone and texture where possible. 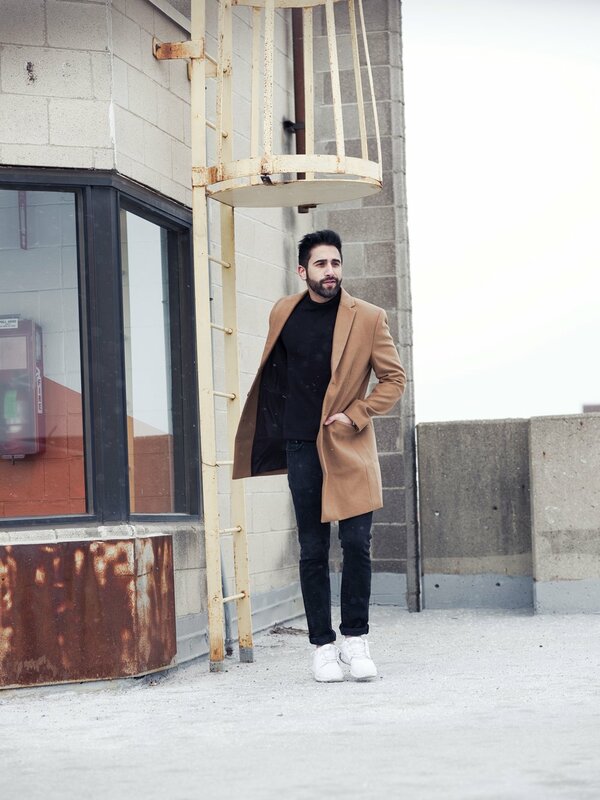 With this outfit, I was actually hesitant to wear this camel/brown coat from Asos with black pants and a black turtle neck. But, I decided to take the risk and I couldn't be happier with how it came out. Alright, that's it for this week - let me know what you like most about the outfit and / or any ideas that you have that could add to this outfit! Hey guys, I hope all is well! It's been an extremely busy start to fall for me, particularly in the last month. Outside of this blog, I'm working on 5+ projects and will eventually need to narrow my focus down. I feel as if I'm just starting to scratch the surface with this outlet - I've received so much great feedback and support. I'm focused on creating an experience that you guys can use as inspiration for your own outfits. I'm learning how to get more creative, improve my styling, and raise the overall standards of my product. For this outfit, as inspiration to all my guy friends (although all of this is meant to inspire both ladies and gents:) ), I decided to go with a classic fall look that is simple yet stands out. 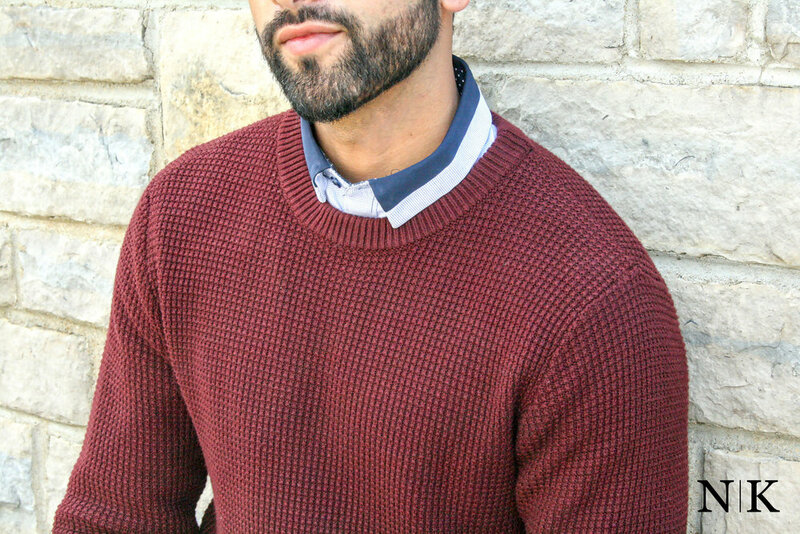 I went with a maroon textured knit sweater layered on a light blue printed dress shirt. For pants, I chose skinny innovator dress pants from Express and finished the outfit with a pair of Chelsea boots. This is the perfect outfit for work, any sort of networking event, or happy hour with friends. I intentionally wanted to stick with a fairly simple outfit that was true to fall styling and colors. My advice for taking a simple outfit like this to the next level is adding some texture or print to one of the layers. 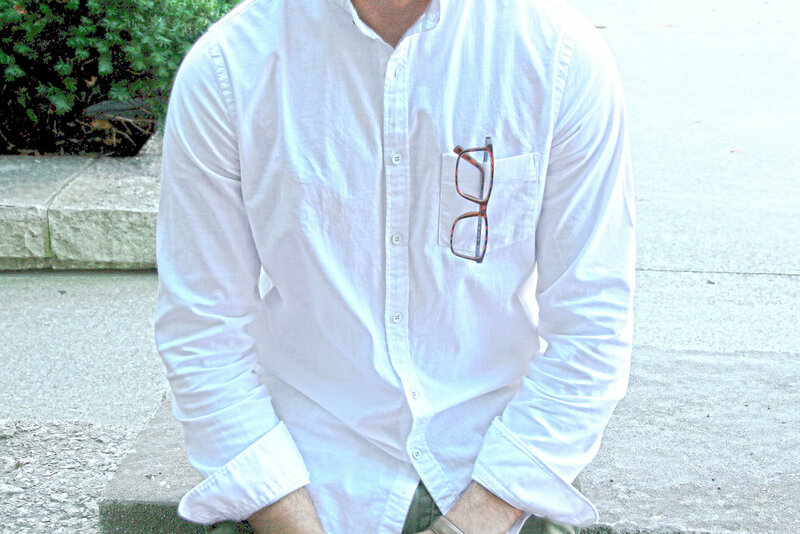 The dress shirt I wore for this shoot includes print and a solid color band at the top of the collars. This really helps brings some pop to the outfit. Alright guys, I hope this was helpful and thank you for reading! Hey guys, hope you're doing well. It's been a little over a month now since I did my first blog post - I hope you guys have enjoyed it so far! It's still a work in progress, but I'm super excited to show some of the stuff I've been working on. Occasionally, we'll get a few rather nice days where it doesn't feel like fall. 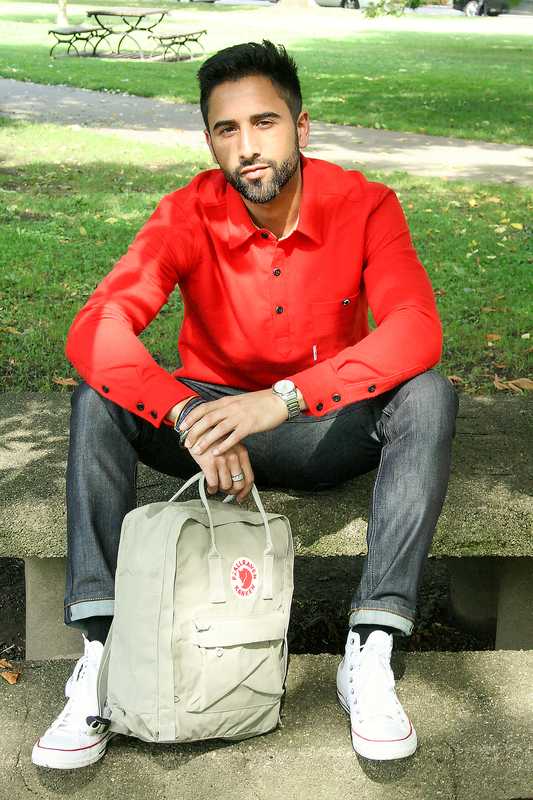 When you do get that chance, mix it up with something that expresses you and is comfortable. Something I really like to do and what I do for this outfit was almost 'dressy-casual'. I love trying new things and collarless shirts are where it's at. 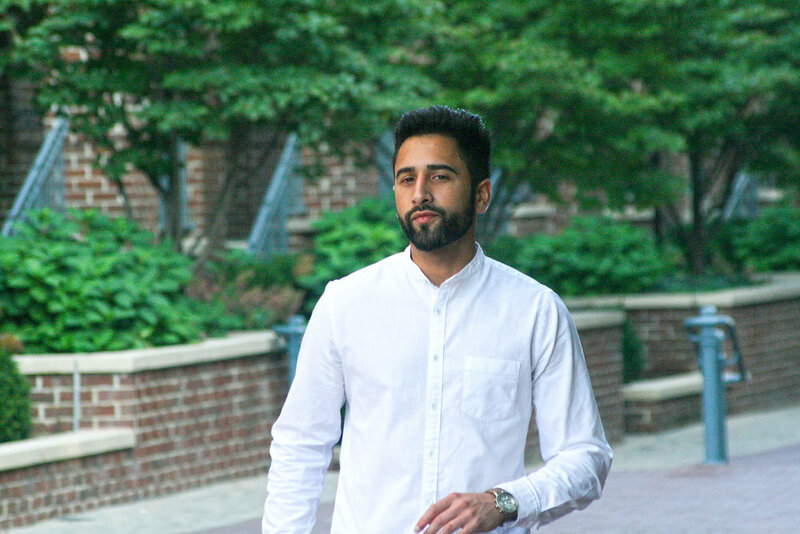 I paired this white linen collarless shirt with olive chino's from J. Crew. What I love about it is the relaxed and almost summer vibe the outfit gives, yet the linen shirt reacts well to the season and traps warmth for a slightly chiller day. The pants are also very relaxed and allow ample room for movement. To round the outfit out, I put on my simple and ultra comfortable Roshes. Suffice to say, this outfit is a winner for me. That's it for this week, friends. Tell me your thoughts and thanks for reading!! Hey guys, I'm super excited to share this post with you! I hope everyone had an awesome weekend. Now that summer is past us, it's time to prepare for what industry experts call the most important fashion season of the year, fall. Fall is the perfect opportunity for layers, bold colors, and a chance to experiment with different fabrics. For this blog post I collaborated with local shop, Tigertree, to help kick off their fall collection. Owners Josh and Niki Quinn have been able to bring established brands like Ben Sherman and Levi's with up-and-coming lines such as Dear Creatures and Native Youth. What I love about their story is, at one point they were headed to LA when they stumbled and fell in love with Columbus. After falling in love with the Short North, they decided to stay in a community they felt they could have a bigger impact. As I mentioned, fall is a great time for layers and to mix and match fabrics - that's why I decided to layer a nepped viscose-wool blend knit sweater on a plain white dress shirt with cotton pants. This is a great outfit you can wear to work and transition into evening events with. To round out the outfit, I would recommend a pair of Chelsea boots to give the overall look a classic and sleek finish. My favorite part of this outfit is the flecked blue sweater with the ribbed finish. For my second outfit, I went with a very casual full sleeve pocket pullover and skinny denim jeans. This dressed down look is perfect on a day filled with outdoor activities. The outfit is comfortable as it looks, but still is able to give a sense of design and style through simplicity. 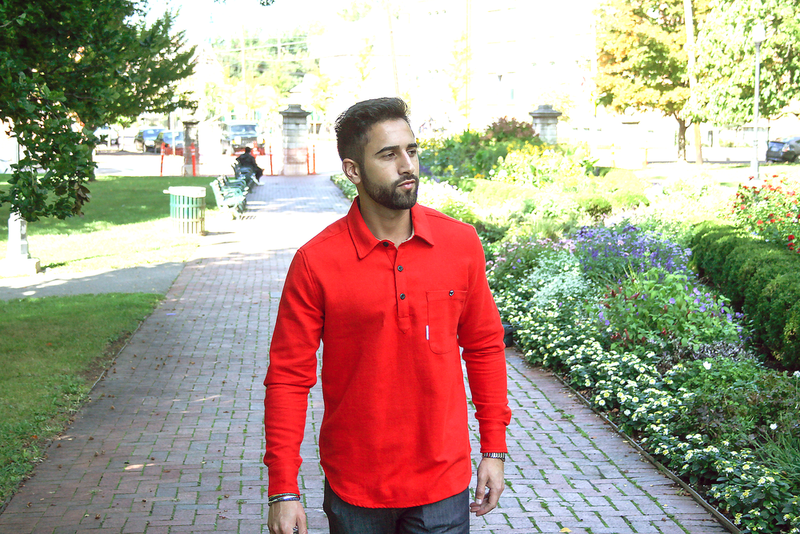 The pullover is extremely durable and can be used for layering or as a statement piece. Well that's all for now, let me know if you would wear any of these outfits and what other fall style essentials I may have missed. Talk soon!! I feel like I'm at a point in my life where all my friends are getting married. To make it even more interesting, my sister and cousin got married this past summer, both of whom are younger than me. 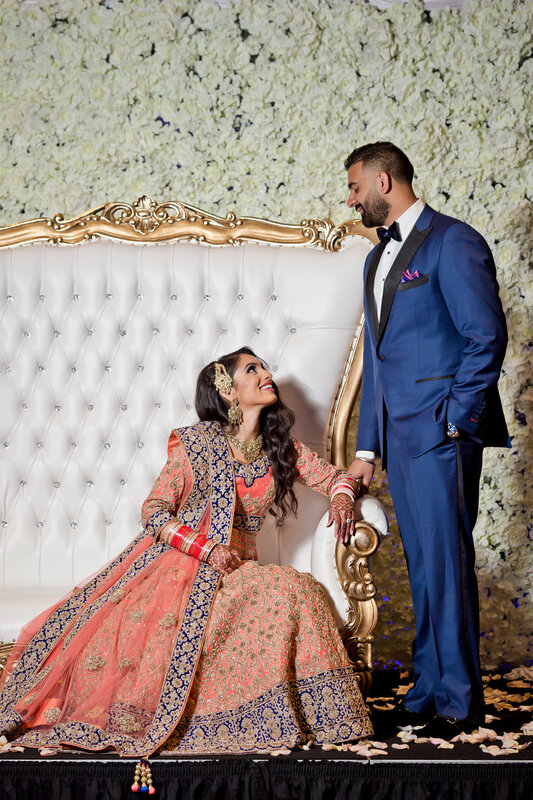 As many of you know, both hold a special place in my heart and in our circle of family and friends - which is what inspired me to share with you how Punjabi weddings work and what makes them special. If you've ever been to a Punjabi wedding, you know how lavish and over-the-top they can be. An average wedding can easily cost $200,000. The tone is set with the actual invitation. The invitation is usually multiple pages and each page is carefully crafted and designed. You can tell how serious it is just from the sheer thickness of the paper. For some background, historically, most Sikh weddings were arranged. However, today, it is accepted that Sikhs marry someone they choose themselves. Of course, in order to show respect to their parents, it is best to seek their approval. Traditionally, the parents of the man ask the parents of the woman for their daughter's hand in marriage. 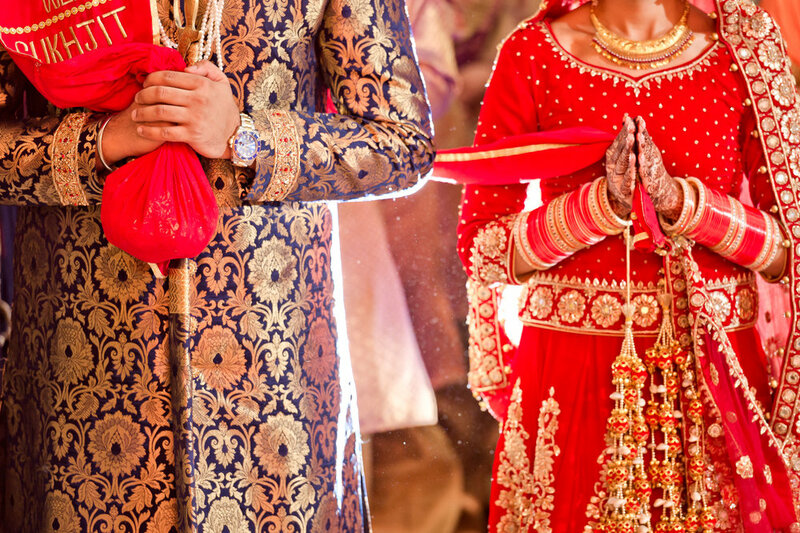 To get started, Punjabi weddings have events on both the groom and brides side 4-5 days before the actual wedding - here I will try to highlight only the main events. About a week before the wedding, there is the Sagan, which is when the bride's family visits the groom's family with gifts to confirm the engagement. Around the same day, there is the Lady Sangeet, which is a function hosted by the girl's family held for the bride and her bridesmaids. The bride's family plays music and sings songs related to the bride and groom. Nowadays, people hire DJs and have a party, followed by dinner. Another ritual is to hold an Akhand Path, which signifies a happy and beautiful occasion and to receive the blessings of the Sri Guru Granth Sahib, the central religious scripture of Sikhism. A couple days before the wedding is the Mayiaan, an event that includes tons of singing and multiple rituals. One of which is the Vatna, in which the bride/groom are rubbed with a tumeric paste to cleanse and balance the body for married life. Then there is the Jaggo ceremony. During the Jaggo, the family dances and sings on the road in front of the beautifully decorated wedding home. As they dance, the aunts of the bride/groom hold a copper vessels above their head, which are decorated with divas (clay lamps) and lit. It usually is a loud ceremony, filled with joy, dancing, fireworks, and food. Note: This is also when neighbors down the street start to question what the h%$l is going on. A few of them might stop over and remind you they still have to work the next morning. On the morning before the wedding, a ritual of Chura (involving a set of ivory and red bangles) is performed at the bride's residence in which maternal uncle and aunt play an important role. The uncle and aunt place the bangles on their niece while the women sing traditional songs. People touch the chura and give their heartiest wishes to the girl for her future married life. Similarly, the groom also receives a set of clothes called sherwani from his maternal uncles which he, too, wears at the wedding ceremony. 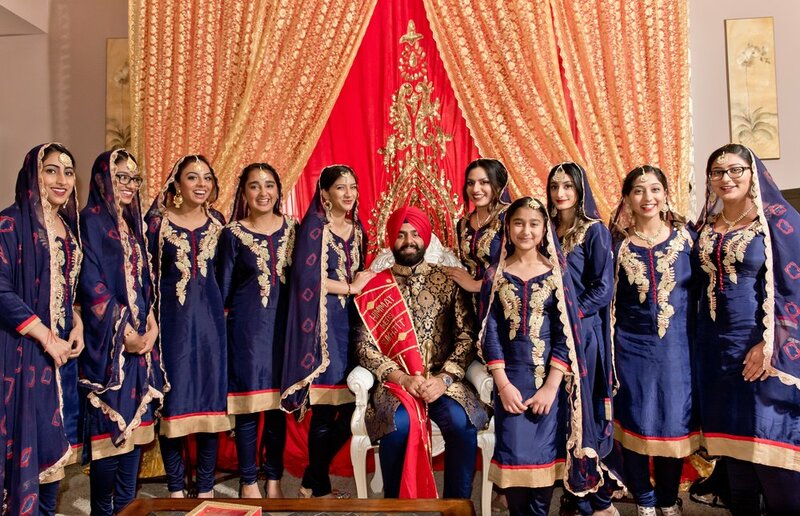 This takes us to the actual day of the wedding (where most of the pictures are from), which includes the Baraat & Milni, Anand Karaj, and reception. The Baraat and Milni take place right before the actual wedding ceremony. Milni literally means "Introductions". In a Sikh marriage, Ardas is performed by the person in charge of looking after the Sikh scriptures, followed by the formal introductions of senior men in the families. As a token of good luck, the girl's relatives give the groom's close relatives gifts of cash and clothes. Following the Milni, is the Anand Karaj, a marriage ceremony held at a Gurdwara (temple). The Anand Karaj ceremony is a joyous and festive event in which families and friends from both sides are heavily involved. The four lavaan (hymns) are recited while the couple walk in a circle four times around the Sri Guru Granth Sahib. The wedding usually takes place in the morning and is completed before noon. Then there is the extravagant reception. The reception is all about food, dancing, and celebrations. It's like a scene out of a movie. If you haven't been, I strongly advise you make a few Punjabi friends. It's definitely one of the most memorable events you will ever attend. If you want a more in depth breakdown and have a few laughs, check out my boy's video. Thank you all, I hope you enjoyed it. Please let me know if you have any feedback or comments! As Autumn approaches, we've seen the emergence of bold patterns and prints in menswear with designers using camouflage as a key theme in their collection. Guys can be intimated or even put off by camo, whether they think it's better suited for outdoor activities or just not for them. However, if you're willing to experiment a little, camo can look cozy and effortless if done right. Granted you won't be wearing camo to a black-tie event, camo can still be a smart outfit and a staple in your closet. If you're not quite sure where to start, working in a jacket can be an easier way to transition. The key is to keep everything else simple. You want the camo piece to be the statement. Pair it with plain pieces, white shirt, navy pants, and plain shoes. Some other tips that work well - starting with black jeans/trousers, a white or light blue Oxford shirt, and some basic trainers. For those that aren’t sure what the first step in achieving camo perfection should be, I'd say start simple with accessories or with a backpack. Camo is really an impressive style and shows a real sense of confidence. Thank you for reading! Any comments or feedback welcomed! Hey guys, thanks for checking out my first post! As summer winds down and football season right around the corner, this post focuses on a staple every guy should have in his closet – denim. Before we get into the outfit, I want to take a second to mention where Jake (my wonderful photographer) and I decided to shoot this post. 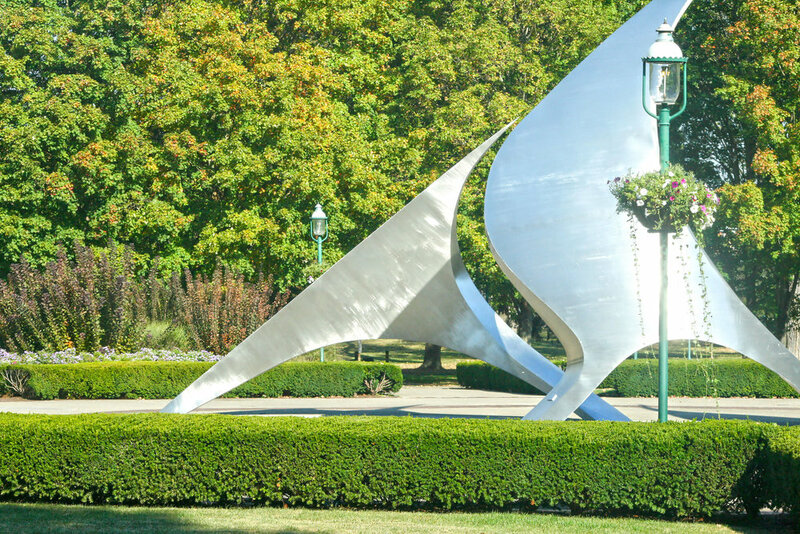 Established in 1867, Schiller Park is located in German Village and is the second oldest park in the City of Columbus behind Goodale Park. There are very few places in Columbus that are as peaceful and beautiful in the morning as Schiller Park. If you haven’t visited Schiller Park, I definitely recommend it, as it’s a well-kept jewel in German Village. The reason denim is so great is because it can be worn during multiple seasons and through transitional seasons. Not only is denim a versatile material, it’s iconic. It’s the quintessential American look that can be worn from head to toe. Denim roots can be drawn back to Italy and France, although denim jeans were brought to life in the US by Jacob Davis and Levis Strauss in 1873. Let’s be real, you can’t go wrong with denim when legends such as John Wayne and James Dean rocked it! As you can tell, I went with a fairly dressed down outfit – a denim shirt from Express layered on a simple white t-shirt. Wearing the denim against black pants gives the outfit some pop, while still acting casual. A light denim shirt or jacket similar to this is perfect as it keeps you warm without holding too much heat. I added my white Converse Chuck Taylor High Tops to give the overall look a little more character and swag. Would love to get your thoughts and answer any questions! Thank you for reading! Sign up with your email address to stay connected and receive news and updates from me!